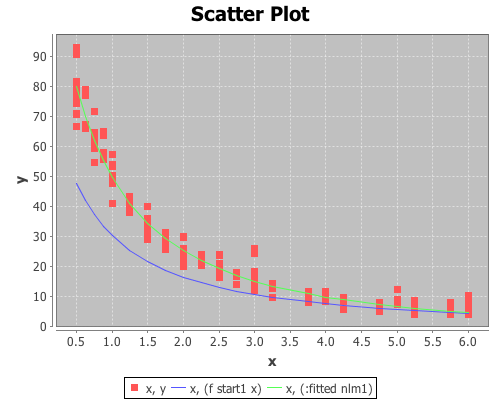 This example will demonstrate how to fit a non-linear least-squares model in Incanter using the non-linear-model function. This example will use a data set from NIST, which are the result of a NIST study involving ultrasonic calibration. The response variable is ultrasonic response, and the predictor variable is metal distance. You will need the incanter.core, incanter.optimize, incanter.charts, and incanter.datasets libraries. This function will be passed to the non-linear-model function, and will need to take a vector of parameters, theta, and a value (or vector of values) of x as arguments, and return one or more values of y. The non-linear-model function uses either the Gauss-Newton (default) or Newton Raphson (available using the :method option) algorithms to estimate the values of theta that minimizes the residual sum of squares. Both algorithms require starting values for the parameters. Finding these values is a bit of a black art, and may require plotting different values. 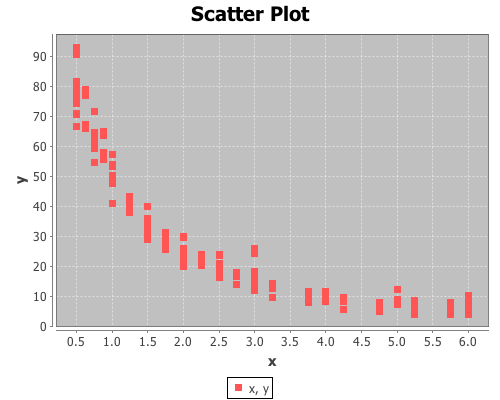 In this case we will start by plotting some start values, provided by NIST, on the scatter plot of the data. These values, provide a generally correct shape for the model function, so we will use them as the start values in the non-linear-model function, using the default Gauss-Newton algorithm. The fit looks pretty good. Interestingly, these start values failed to converge to the correct solution when the optional Newton-Raphson algorithm was used. 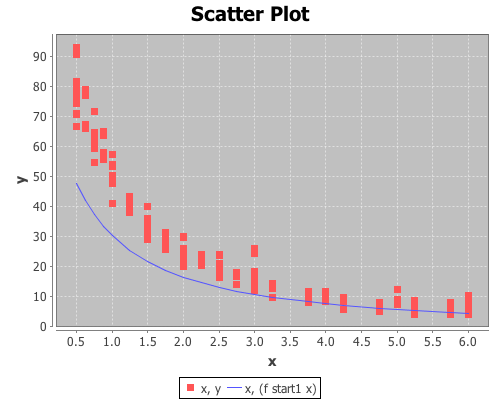 The Newton-Raphson algorithm performed correctly with a second set of start values that were closer to the final estimates.